Any and all information and content made available through the Services ("Information And Content") is provided solely as a convenience to you for general informational purposes only and are not intended to provide specific commercial, financial, investment, accounting, tax, or legal advice. The Services and all Information And Content is provided to you solely for your own personal, non-commercial use and not for purposes of resale, distribution, public display or performance, or any other uses by you in any form or manner whatsoever. XE does not guarantee the accuracy, authenticity, timeliness, reliability, appropriateness, correct sequencing, or completeness of any of the Information And Content, including without limitation any information posted on XE Community forums. You agree that all risk associated with the use of, or reliance on, any of the Information And Content accessed through the Services rests with you. You further agree that XE shall not be responsible or liable, directly or indirectly, in any way for any loss or damage of any kind incurred as a result of, or in connection with your use of, or reliance on, any of the Information And Content. display, download, archive or print a single copy of any discrete Information And Content, or any information and/or content otherwise distributed by or from XE, solely for internal, personal, non-commercial purposes, provided that, in doing so, you do not further distribute, sell, or modify the Information and Content in any way, maintain all copyright and other notices contained therein, and you comply with the User Conduct and Obligations set forth herein (collectively, the "Permitted Uses"). Educational Use: Solely for educational purposes in an academic institution or environment, you may freely display, download, archive, print, or distribute to your students Information And Content from the XE site (such as printouts, copies, or images of XE web pages or apps – but under no circumstances raw currency data) provided that, in doing so, you maintain all copyright and other notices contained therein, and you and your students comply with the User Conduct and Obligations set forth herein. remove, disable, defeat, or change any functionality or appearance of the Services or intentionally alter the format in which financial and currency data is provided by XE or otherwise circumvent the Services' regular interfaces to such data; and embed or import any financial and currency data provided in, on or through the Services into any information services (whether or not web-based), data files, or application software, including without limitation accounting and payroll systems, except as specifically permitted in writing by XE. 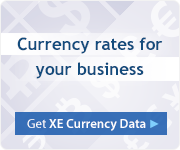 embed or import any financial and currency data provided in, on or through the Services into any information services (whether or not web-based), data files, or application software, including without limitation accounting and payroll systems, except as specifically permitted in writing by XE. The foregoing prohibitions expressly include, but are not limited to, the practice of "screen scraping", or any other practice or activity the purpose of which is to obtain lists of data, portions of a database, or other lists or information from the Services, in any manner or in any quantities not authorized in writing by XE. By uploading, posting, transmitting, sharing, or otherwise making available to the Services any information or content, or submitting any materials for use on the Services, you grant (or warrant that the owner of such rights has expressly granted) XE or its designee a perpetual, royalty-free, irrevocable, fully-paid, non-exclusive, worldwide right and license to use, reproduce, modify, adapt, publish, sublicense, translate, reformat, create derivative work(s) or adaptation(s) from, and distribute such information, content, and/or materials. All analysis, commentary, views, and opinions (the "Market Analysis") expressed on or through the Services represent those of independent third parties and not XE. Although the Market Analysis has been obtained from sources which XE believes to be reliable, it has not been independently verified. By its nature such information is subject to human error and judgment. In addition, financial markets and general economic conditions are subject to rapid change and uncertainty. As a result, XE does not guarantee the accuracy, authenticity, timeliness, reliability, or completeness of any of the Market Analysis. The Market Analysis is provided for informational purposes only. No part of the Market Analysis constitutes investment advice nor should it be considered as such. You should not rely on the Market Analysis when making investment decisions. You agree that all risks associated with the use of, or reliance on, any of the Market Analysis rests with you. ALL WARRANTIES, TERMS AND CONDITIONS, EXPRESS OR IMPLIED BY STATUTE, COMMON LAW OR OTHERWISE, ARE EXCLUDED TO THE MAXIMUM EXTENT PERMITTED UNDER APPLICABLE LAWS. XE DOES NOT REPRESENT OR WARRANT THAT SOFTWARE, INFORMATION AND CONTENT, OR MATERIALS IN THE SERVICES ARE ACCURATE, COMPLETE, RELIABLE, TIMELY, CURRENT, ERROR-FREE, OR OTHERWISE RELIABLE, OR THAT THE SERVICES ARE FREE OF VIRUSES OR OTHER HARMFUL COMPONENTS. THEREFORE, YOU SHOULD EXERCISE CAUTION IN THE USE AND DOWNLOADING OF ANY SOFTWARE, INFORMATION AND CONTENT, OR MATERIALS AND USE INDUSTRY-RECOGNIZED SOFTWARE TO DETECT AND DISINFECT VIRUSES. AS A VISITOR TO THE SERVICES, YOU ACKNOWLEDGE AND AGREE THAT ANY RELIANCE ON OR USE BY YOU OF ANY INFORMATION AND CONTENT SHALL BE ENTIRELY AT YOUR OWN RISK. TO THE EXTENT THIS LIMITATION ON LIABILITY IS PROHIBITED, XE'S SOLE OBLIGATION TO YOU FOR DAMAGES SHALL BE LIMITED TO $1.00. You acknowledge and agree that XE reserves the right, in its sole discretion and at any time, to modify, change, add to, terminate, or discontinue (with respect to an individual user or all users) the Services and/or any associated services, Information And Content, or technical specifications with or without notice to you, and that XE will not be responsible or liable, directly or indirectly, to you or any other person in any way for any loss or damage of any kind incurred as a result of, or in connection with, any such modification or discontinuance. "XE", "XE.COM", "UNIVERSAL CURRENCY CONVERTER", "XE MONEY TRANSFER", the XE logo, the spinning currency logo, and other identifying marks of XE are and shall remain the trade-marks and trade names and exclusive property of XE CORPORATION, and any unauthorized use of these marks is unlawful. Other trade-marks on the Services are the property of their respective owners. All content in the Services, including without limitation all programs, complied binaries, interface layout, interface text, documentation, and graphics, is the copyrighted property of XE and is protected by international copyright law. The Information And Content may be used by you only for your personal, non-commercial use as expressly provided for in the Permitted Uses and may not be taken out of context or presented in a misleading or discriminatory manner. Any rights not expressly granted to you are reserved by XE. You acknowledge and agree that your correspondence and business dealings with any third parties, including any merchants or advertisers, found on or accessed through the Services, including payment for and delivery of any related goods and services, and all other terms, conditions, representations, and warranties related to such dealings, are solely as between you and such third parties. 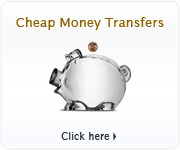 You understand and acknowledge that some of the services accessible through the Services are provided by third parties and may make use of the XE name, logo and/or other identifying marks of XE, (including, but not limited to, discount foreign exchange services provided by HiFX and made available through the Services as XE Money Transfer) and that in certain instances, XE may receive referral fees and/or other compensation from third parties on a per use or other basis based on your purchase or use of third party goods or services found on or accessed through the Services. YOU ACKNOWLEDGE THAT IN SUCH DEALINGS WITH THIRD PARTIES, XE IS NOT THE SELLER OR PROVIDER AND YOUR AGREEMENT OF PURCHASE OR FOR SERVICES WITH SUCH THIRD PARTY IS SOLELY BETWEEN YOU AND THE THIRD PARTY, AND NOT XE. 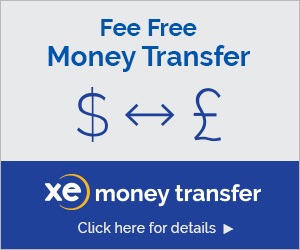 XE ASSUMES NO RESPONSIBILITY WHATSOEVER FOR ANY CHARGES, LOSSES OR LIABILITIES YOU, OR ANY USER OF YOUR ACCOUNT, INCURS WHEN MAKING PURCHASES, DEALING WITH OR COMPLETING TRANSACTIONS WITH SUCH THIRD PARTIES. By accessing third party services through the Services, you hereby authorize such third party service providers to provide XE with personal information regarding your use of and your activities with respect to the purchase and use of third party services and/or goods.